WebSurge runs with a small core load engine and this engine is plugged into the front end application I’ve shown so far. There’s also a command line interface available to run WebSurge from the Windows command prompt. You can run WebSurgeCli.exe from anywhere to run tests for either an individual URL (similar to AB.exe for example) or a full Session file. 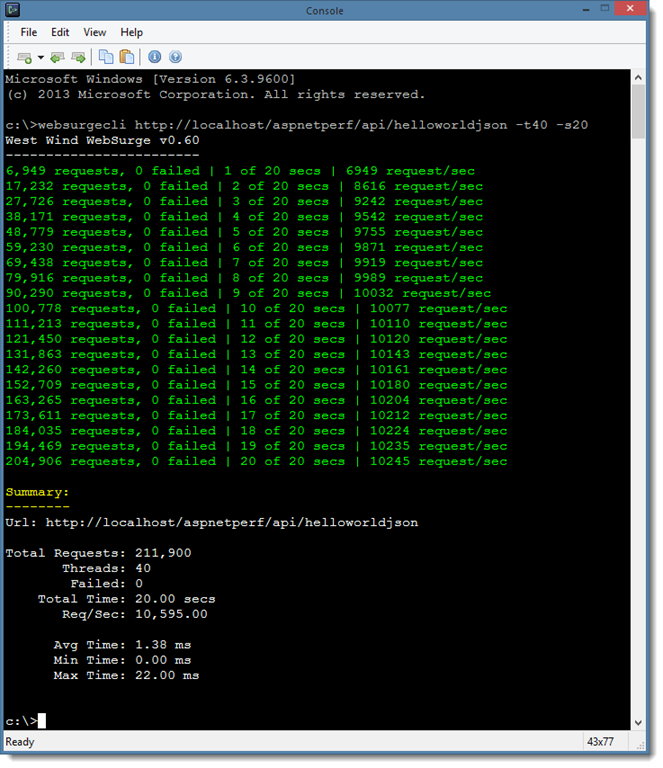 By default when it runs WebSurgeCli shows progress every second showing total request count, failures and the requests per second for the entire test. A silent option can turn off this progress display and display only the results. The command line interface can be useful for build integration which allows checking for failures perhaps or hitting a specific requests per second count etc. It’s also nice to use this as quick and dirty URL test facility similar to the way you’d use Apache Bench (ab.exe). Unlike ab.exe though, WebSurgeCli supports SSL and makes it much easier to create multi-URL tests using either manual editing or the WebSurge UI.